Stick a candy cane into a swirl-topped cupcake and sprinkle with chocolate and it looks a lot like the whipped cream on top of holiday hot chocolate! 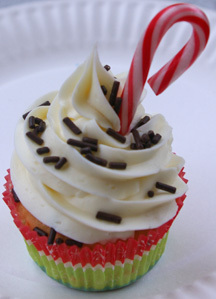 What You Need: 1 cupcake; white or off-white frosting; chocolate jimmies; mini candy cane; pastry bag and 1M swirl tip. How to Make It: Make 1M swirl. Immediately sprinkle with chocolate jimmies. Add candy cane. That’s it! This entry was posted on Monday, December 21st, 2009 at 11:03 am	and is filed under Christmas cupcakes. You can follow any responses to this entry through the RSS 2.0 feed. Responses are currently closed, but you can trackback from your own site.